﻿Brunswick Sales are Australia's premier construction, manufacturing and supplier specialists. Brunswick Sales has been a leader in the manufacturing and supplying of Specialised Construction Products to the commercial construction industry for over 40 years. As we specialise in construction we have a full Product List including specialised construction equipment, pumps, masonry support systems, control joints and more. 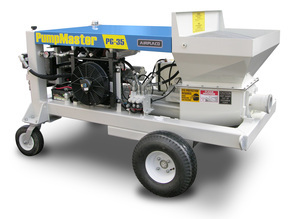 Reduce costs and time on your next construction project with a mobile construction pump for concrete or grout. 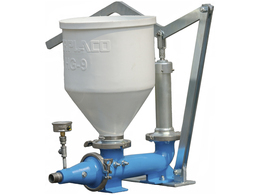 Our pumps are designed to be flexible for almost any situation and project. 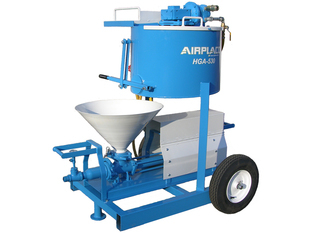 The AIRPLACO PumpMaster PG-35 masonry grout pump is shown in a typical wall grouting jobsite to illustrate the use of a grout pump for masonry contractors. The PG-35 is built specifically for masons who need to fill blocks at the rate of 10 yards per hour and who benefit from the mobility of a compact, self-propelled machine on the construction jobsite. * The HGA-530 incorporates a heavy duty air-powered piston pump. The latest innovation in grouting, the Handy Grout HG-9 grout pump, includes a cast assembly and polyurethane hopper. 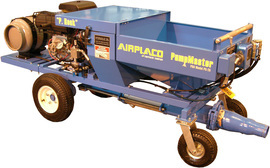 This grout pump design maximizes two important features, durability and weight. The HG-9 grout pump's cast assembly ensures a durable design free from excessive welding and its polyurethane hopper ensures lightweight and easy cleaning. The HG-9 grout pump's horizontal piston ensures a self priming pumps through its heavy-duty ball check manifold system An in-line pressure gauge allows the operator to monitor the efficiency in relation to the thickness of the slurry used for the application.